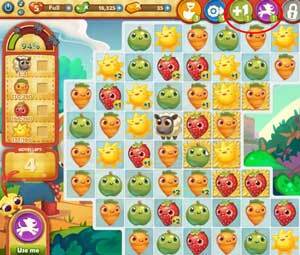 These Farm Heroes level 534 cheats and tips will help you beat level 534 of Farm Heroes. 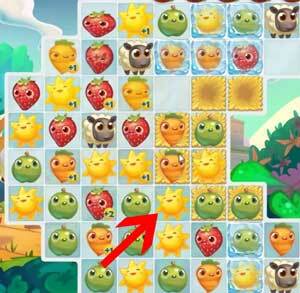 The objective of Farm Heroes level 534 is to collect 4 sheep, 180 orange carrots, 180 red strawberries, and 180 yellow suns in 23 moves. 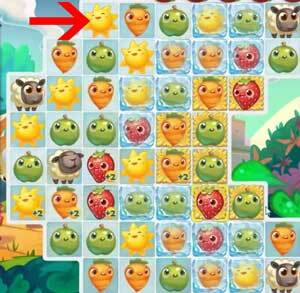 The big task in Farm Heroes Saga level 434 is the herding of the sheep. However, there is a wall of ice blocking you from reaching the hay. So, your first order of business will be to remove the ice. To do this, create a match with the frozen cropsie inside. In the process, try and make as many matches count towards your needed cropsies. This way you can save some moves and help your cause. Level 534 Cheat #2: Herd those sheep! With the ice gone, you are now free to move the sheep to the hay. In order to do this, you’ll need to move the sheep by making matches next to him. The sheep will jump to wherever the finishing match was completed. Therefore, try and make it so that your finishing match ends on a nice stack of hay. After herding the sheep, you may need some help collecting your remaining voosters. If this proves to be the case, use your trusty boosters. The plus one value booster and color collector booster will both prove handy here as they can help you collect your needed cropsies in quickly.